Reverb is a global marketplace with over 250,000 sellers and over a million live listings. How can your listing possibly stand out? Taking quality photos and pricing your gear competitively goes a long way. But beyond that, you still have one more tool: Reverb Bump. In a nutshell, the Bump feature prioritizes your listing in search results, showing it more often and in the top row, before users see any other listings. This prioritization extends to real estate outside of Reverb, too, in the way we give your listing premium placement in Google Shopping results, Facebook Ads, and on hundreds of third-party websites. Get 30% more views on average than non-Bumped listings. Sell twice as fast on average than non-Bumped listings. Appear in top spots on Reverb’s homepage, Search Results, Category Pages, Handpicked Collections, Brand Pages, as well as Google Shopping, Facebook, and hundreds of other third party websites. Beyond that, Bumped listings appear as the first “Add to Cart” option on a comparison shopping pages (for brand new gear), and in the “Bump Row” for used gear, leading them to sell 4x faster on average than non-bumped listings on those pages. Because search results are sorted by relevancy and publish date, Bumping ensures that listings that have been on Reverb for some time are still in the mix to be pushed ahead of the pack, as long as the bump feature is active. Which Listings Should You Bump? While you can certainly Bump all your listings and see an effect, Bump will have the biggest impact when it is used on listings that are competing for attention in a crowded field. As such, Bumping brand new gear will get you the most bang for your buck. Listings for the same piece of new gear all have similar photos, similar or identical pricing, and they’re plentiful. Having your listing Bumped for that hot new item will put it in rotation for the “Add To Cart” position at the top of comparison shopping pages. Most users will click the top listing to make the purchase when all the listings are essentially identical on a comparison page. Bumping common used gear will help in the same way, especially if the market range is tight. 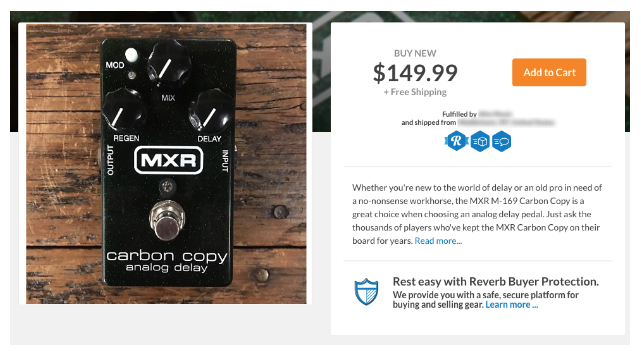 For example, if you’re listing the same used pedal that 15 other people have listed for between $50-$60, Bumping will get your listing into a top spot and increase the chance it will sell before the others. How Much Does Bump Cost? How much you spend is entirely up to you. There are different tiers of Bump that place your listing more frequently and aggressively in high-exposure spots as you pay more. 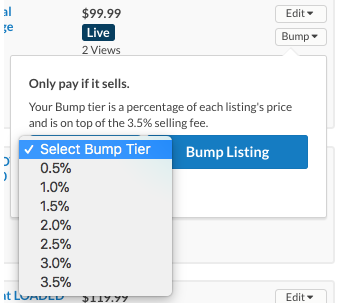 Bumps are paid as a percentage of the listing sale. You can dedicate as little as 0.5% and up to an additional 3.5% of your sale for premium exposure. There is no upfront cost. You only pay the additional fee if it sells. You can also change your Bump percent or remove Bumps all together at any time. There is no long-term commitment. You can set or change percentages on an individual basis from the listings page or while viewing the listings themselves. You can also Bump listings in bulk. Just go to the top of your Listings page and select it for all your listings. If you’d rather just Bump every listing you put up automatically, you can use the Auto-Bump tool. This app automatically Bumps each listing you create without any additional effort on your end.